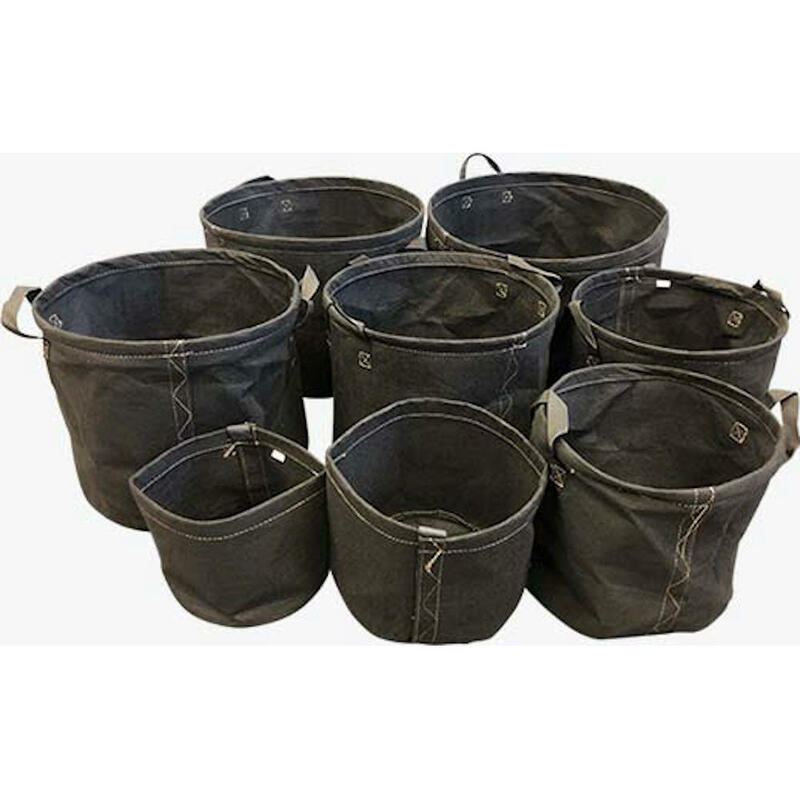 A range of sizes of fabric pots from 15L to 90L are stocked at Aqua Gardening. If want faster growth, and a lower price than air-pots, fabric pots are the way to go! or 4 payments of $1.20 . As it's name suggests, fabric pots are made from a breathable fabric. We use 300gsm and 350gsm fabric which is much thicker than many on the market - making in more durable and less prone to transpiration loss. Fabric Pots are breathable fabric plant containers "air prune" your plants' roots when they reach the end of the container. The air root pruning process forces the roots to branch out with more fibrous feeder roots which are much more efficient in taking up water and nutrients. The very durable geotextile fabric is porous, allowing air into the root zone and provides great drainage creating a healthy environment for the roots. Fabric pots encourage horizontal and vertical roots, but unlike the case with conventional plastic pots, once the roots reach the wall of the fabric pot they are ‘air pruned’. The root effectively stops growing and will not grow round and round the inside of the pot (pot bound). The plants' energy instead is focused on growing new feeder roots, creating a dense, healthy root system. Fabric pots allow the movement of air from outside the pot, through the pot wall, and directly to the root zone. Oxygen is able to reach the root zone from all sides enabling roots to breathe and beneficial microbes to thrive. When in direct sunlight, heat is not absorbed by plastic or terracotta which heats the plants root ball, causing sweating and stress to the plant. Instead the breath-ability of the fabric effectively cools the root ball in the same way evaporative cooling cools a house. Over watering is a major problem for all potted plants. Fabric pots allow free drainage through the bottom as well as the sides, making it nearly impossible to over water. Fabric pots can be top watered, or used in a flood and drain (ebb & flow) system where nutrients can be absorbed through the pot on all sides. Like traditional pots, fabric pots are very portable, and can be easily moved. Fabric pots come flat packed so you don't have to juggle bundles of plastic pots. The larger sizes (15, 20, 25, 30, 40 & 50 Litre) have a wire rim that self supports the pot, holding the pot open, making it easier to add media etc. The 5 &10 Litre fabric pots have a velcro side opening. This allows for easy removal of the plant for transplant, and for pot re-use. At Aqua Gardening we have trialed Fabric pots against regular round plastic pots (and "geopots"), and the results are impressive. Our tomato planted in the fabric pot grew faster and healthier than the regular pot, with the overall size around 50% larger. Combine this with the fact fabric pots can be reused after being washed, they are definitely one of the best pots available. This calculator will give you the delivery charges for this product only. Once you place all the items you wish to buy in the cart, the combined shipping price will be shown, including Free Shipping if you are eligible. What is the eligibility for Free Shipping? As long as your delivery address is in our free shipping zone, and your order is above the minimum value for free shipping, your shipping will be free. For full details see our shipping information here. The term ‘Aqua Gardening’ or ‘us’ or ‘we’ refers to the owner of the website whose registered office is 4 Billabong St, STAFFORD, QLD, 4053, AU. Our ABN is 69 167 108 367. The term ‘you’ refers to the user or viewer of our website.